In a hurry? Read the quick and dirty version here! There is substantial evidence that Stannis will employ a brilliant set of tactics to brutally defeat the Frey forces that are advancing on his position in A Dance with Dragons. Cleverly direct the Freys into a trap of colossal proportions. Implement a devastating surprise and maximize the ‘shock and awe’ of his attack. What’s so great is that all of the arguments in favor of this theory are so grounded in readily available material and interpretations. No extreme mental gymnastics are required. This is an unabashedly long essay. If you only want a quick version, you can read the ‘Five-Minute Version’ instead. The reason for the length is because this is intended to be an all-inclusive resource for understanding the Night Lamp theory. Foreword. Acknowledging influential authors and essays. Warnings about spoilers. Lay of the Land. A brief look at the terrain around the crofter’s village. The Stannis Coalition. An assessment of Stannis and his forces. The Frey and Manderly Armies. An assessment of the Frey and Manderly forces. Hosteen’s Strategy. The two likely strategies Hosteen would employ. The Eye of a Storm. How the extreme weather necessarily affects strategy. A Trick from the Pirate Kings. Stannis takes inspiration from his time as the Master of Ships. Baiting the Trap. How Stannis forces Hosteen to prematurely attack. Fire up the Band. The actual arrangement and orders of Stannis’s men. The Night Lamp. The battle at the crofter’s village, step by step. 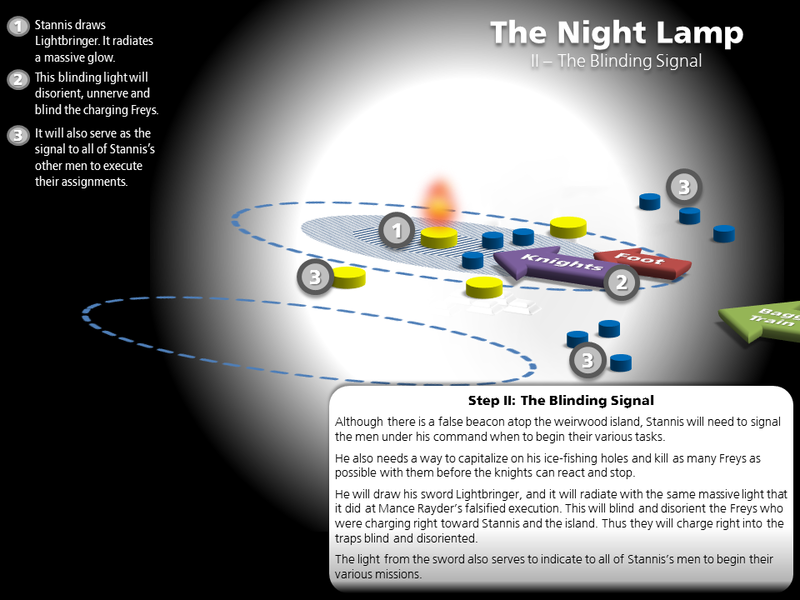 The blinding signal used by Stannis. Fuel for the Fire. Just how is the false beacon implemented? How does Stannis empower his chosen signalling device? The Fat Man Cometh Not. Where is Wyman Manderly in all this? When does he arrive at the village? Sister Cities. 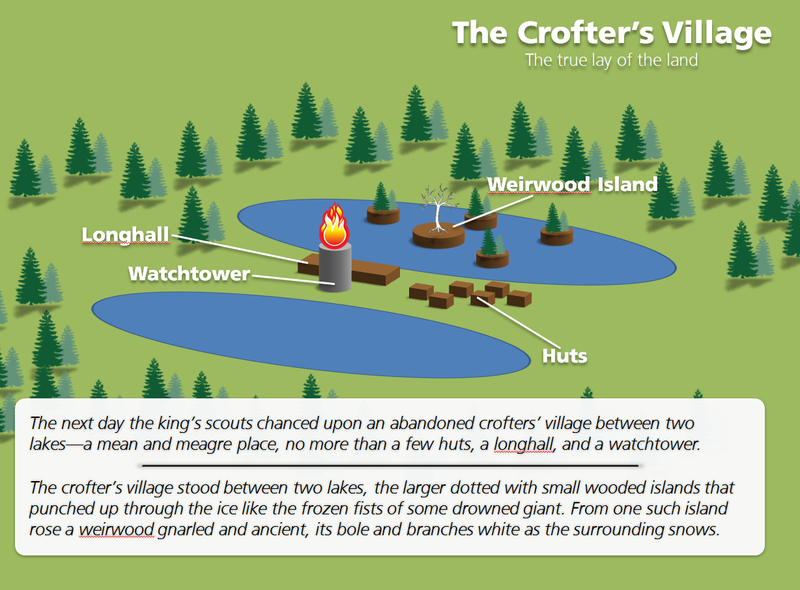 The extreme parallels between the crofter’s village and a wildling village, the relevance to the battle. Potent Passages. Excerpts from the book that take on eerie meaning in light of this essay. Implications. Big questions raised by this essay, and attempted answers. The Five-Minute Version. The quick rundown of this theory. This essay would not be possible without the fantastic original analysis work done by /u/BryndenBFish at his blog, Wars and Politics of Ice and Fire. He wrote a two-part analysis of the battle for Winterfell coming in The Winds of Winter and derived very interesting predictions. I highly recommend reading them before continuing with this post (read part 1 here, part 2 here). 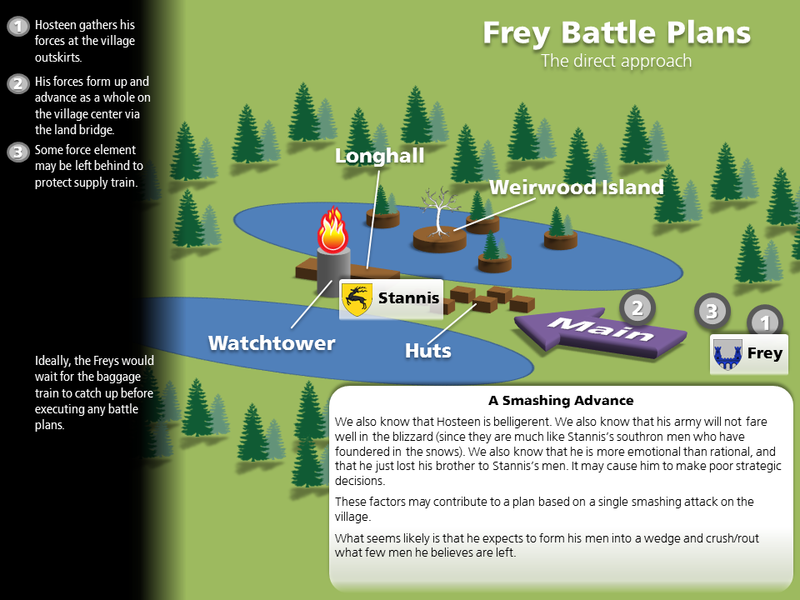 His analysis concluded that Stannis plans to fight the approaching Freys at the crofter’s village. His insights were astounding and I am convinced that this is the case. This essay does not disagree fundamentally with BryndenBFish’s original works. Rather, I propose and evaluate a very specific set of tactics that Stannis can use to defeat the Freys. I’d like to repeat what BryndenBFish says on his posts, this data is entirely speculative. Although I think the ideas here are completely logical and well-suited to the information we have, I am not GRRM. The release of The Winds of Winter could prove these speculations entirely wrong. NOTE: Includes spoilers from The Winds of Winter. The theories referenced above strongly support the conclusion that Stannis will engage the Frey and Manderly detachment at the crofter’s village: the village in which Stannis and his forces have become seemingly entombed. I fully agree with this conclusion: the battle will most certainly happen there. With that in mind, we can begin to explore the strategies that both forces will likely use. Exploring these strategies requires an examination of the current disposition of forces, commanders, force composition, terrain and other conditions that might affect military actions. We begin by looking at the village in which Stannis is encamped. The passages shown in the map are from Asha’s chapters (“The King’s Prize” and “The Sacrifice”, respectively), and give a basic concept of the village. I do not claim to know the exact layout of the village, however the map is helpful at showing the relationships between some of the various landmarks. In particular the islands, the lakes, the village proper and the watchtower. We can also assume that this basic information is part of the map that maester Tybald covertly sends to Roose Bolton. This means Roose Bolton and his allies are also informed about these various landmarks, structures and hazards. The knowledge both sides have regarding the terrain forms a crucial part of what will happen in the pending battle. Here is detailed look at Stannis and his forces. Stannis has a hodgepodge of southron and northerner warriors in his army. BryndenBFish’s essays provide an extremely detailed overview of the number and distribution of these men. Most notably, Stannis’s heavy horse is all but destroyed. While these knights are battle-tested and still capable on foot, they no longer pose the significant threat to enemy footsoldiers that they once did. Based on the numbers at the outset of Stannis’ journey, Stannis likely had anywhere between six and seven hundred knights (1,500 men less 800 horses less some extra heads to account for surplus horses). While the actual number can be disputed, the point remains that large portion (50% or so) of his men were always foot soldiers. Given that these men have already been tested in battle, their resolve and cohesion is much more reliable: their ability to sustain leadership and execute tactics in battle has been verified. Stannis also has highly educated, intelligent lieutenants among these southrons as well: most of them were raised by lords and presumably had some education under maesters and septons. An example of this is their oft-mentioned ability to construct and implement siege engines; additionally they are more likely to be aware of formation-based tactical battlefield maneuvers such as flanking maneuvers and wedges. This means that the southrons are a versatile force, their tested resiliency allows them to be a cornerstone of Stannis’s plan. Their capacity for siegecraft and a small amount of horsemen allows for a small element of the sort of ‘traditional’ warfare his most familiar with. The mountain clans have vastly superior numbers compared to the southrons. Additionally they possess much greater mobility than the southrons, their tiny garrons capable out-running the larger battle-oriented destriers and coursers in the heavy snows. Even their men on foot can outpace Stannis’s own men. This gives them great mobility on the battlefield, useful for screening, scouting and harrying an enemy; and doubly so when deployed against other southrons (such as the Freys and Manderlys). However, the mountain clans are highly fractious by nature. Although united in purpose to avenge Ned and rescue Arya, they are certainly predisposed to disagree on what to eat for breakfast or which clan gets which assignment on the battlefield. They are additionally untested for the most part. Although it’s unclear, its unlikely any of them have significant battlefield experience unless they were old enough to participate in Robert’s Rebellion. Stannis has no idea if they are as good in combat as they say they are. Their morale under duress is questionable. While they may fight well when things look good, how will they fare when their friends and relatives perish, or if the numerical odds are against them? How will they fare if their general says “I need you to hold this perilous position, but trust that I will ensure your safety through military genius”? This results in Stannis knowing that the northern are numerically useful force, but of uncertain reliability. He cannot rationally expect them to hold crucial points on the battlefield, nor do they have the expertise in siege or formation combat that his southrons have. Thus we can see that Stannis has an army that is strongly bifurcated in military utility: a slow-but-resilient force of tested veterans and a horde of mobile-yet-uncertain northerners. Finding the right use for both components is central to understanding the execution of the strategy in this essay. What can I say that hasn’t been said before? He’s an extremely capable military strategist and tactician. He’s demonstrated both naval and land combat genius. He’s shown his tenacity and perseverance. His generally dispassionate nature lends itself to thinking about how to win battles and execute higher strategy, without confusing personal friendships affect his judgment. For an extremely detailed analysis of Stannis military prowess, I highly recommend BryndenBFish’s essay “A Complete Analysis of Stannis Baratheon as a Military Commander”. Unlike Stannis’s forces, the Freys and Manderlys are not traveling or working together. They are essentially two different armies. Stannis’s men have been tested in combat, we do not know that the Freys have as well. This is doubly likely since they were strongly affiliated with Roose Bolton during Robb’s campaign, and Bolton had so cleverly arranged things as to minimize his own casualties. And we know that Manderly’s knights are likely untested as well, after all he did say that they were men he did not dispatch south with Robb, so what other military service have they seen? They are not united. In fact the Freys and Manderlys are at each others throats. While both factions may serve the common goal of destroying Stannis, they will not approach together. At the very least they will not coordinate their efforts. This means that Stannis really faces two separate armies, very unlikely to approach at the same time. When viewed separately, each faction is significantly weaker than Stannis’s army from a numerical standpoint: particularly the Manderlys. We don’t know if Wyman has verified skill as a commander. We don’t even know if he would command his forces himself: he did just nearly get his head taken off. It’s entirely possible that he would delegate such a task to one of his knights. There is no mention of any Manderly knight having significant battlefield leadership or combat experience, so we therefore must conclude that whomever leads this faction likely has uncertain capability. Hosteen Frey is a well-known character, one who has seen significant battlefield action and is a proven warrior. However, his skill as a commander is lacking. Hosteen and Aenys. He remembered them from before he knew his name. Hosteen was a bull, slow to anger but implacable once roused, and by repute the fiercest fighter of Lord Walder’s get. Aenys was older, crueler, and more clever—a commander, not a swordsman. We see that Aenys would have been a better commander for the Freys. Unfortunately we know that he died as a result of a deadfall placed by Mors Crowfood and his men, as Theon mentions in The Winds of Winter. No less a man than Hosteen Frey, who had been heard growling that he did not fear a little snow, lost an ear to frostbite. These are on top of the obvious fact that he openly attempted to kill Wyman Manderly right in the Great Hall of Winterfell, in plain view of many other lords. The Bolton loyalists at Winterfell were all led to believe that Stannis is “snowbound and starving”, most of his military might obliterated by the ongoing blizzard. They also have a map describing the terrain at the crofter’s village. The disarray one would attribute to an army of starving men trapped in heavy snow. The fact that Stannis appears to be camped in a village between two lakes. He appears to have set himself up in a position extremely vulnerable to a flanking maneuver. His idealized plan would likely be to form up some distance from the Stannis encampment, possibly split a portion of his men off and surround both land entries to the village. This would at least be the smart, contemplative choice. An intelligent point that supports leaving the flank open is the notion that enemies are much more likely to break if a retreat is possible. Hosteen seems unlikely to be this sophisticated in his thoughts about battlefield tactics, however. If he chose the direct approach, it would most likely be for reasons related to overzealous self-confidence and emotional impulse. 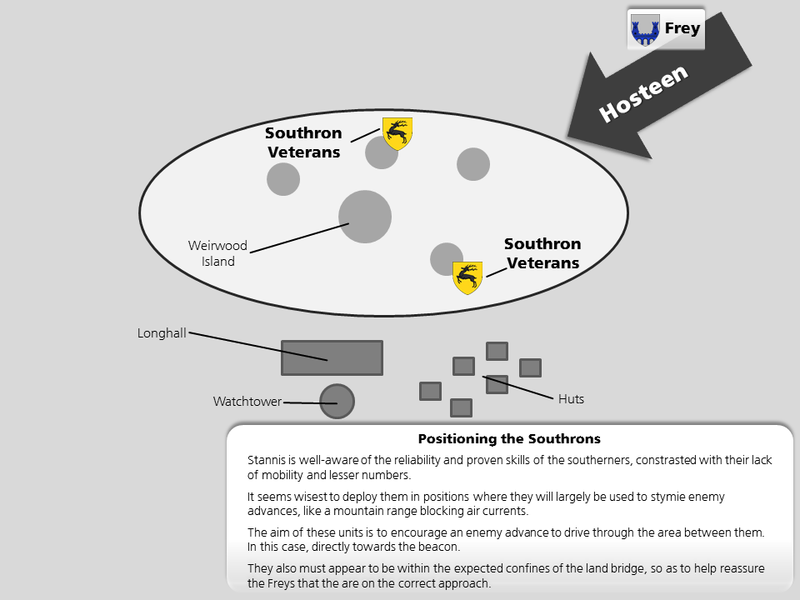 In either case, both of these plans reveal that Hosteen’s forces are compelled to move in a narrow formation if they desire to approach the village via the land bridge. Even the best plans can go to ruin in the face of bad weather. The blizzard crippling the north at the end of A Dance of Dragons is of inestimable size and power. There’s no questioning that the strategies used by the Freys, Manderlys and Stannis are all dramatically affected by it. This is a drastic reduction in visibility. Virtually all of the landmarks have disappeared, only noticeable when extremely close. The lakes, forests, and so on are all hidden beneath a combination of heavy mounds of snow and thick snowfall. Only one landmark remains noticeable amid the blizzard: the beacon fire from the watchtower. It is the only thing that can be spotted at any significant distance. This lack of visibility poses an obvious threat to the Freys: mired in a blizzard and lacking for any other landmarks, Hosteen has only the beacon fire to guide him. Recall that the map showed that only a direct approach would allow him to reach the village, or risk the lakes. In the absence of other navigational aids, the beacon fire is Hosteen’s landmark with which to orient himself. This means that Hosteen will have no way to orient his forces regarding the location of the lakes and the land bridge to the village. It would be very time consuming for him to find the location of the bridge in the snow. Even worse, while he could still try to circumnavigate the lakes and flank Stannis, it splits his forces and isn’t necessarily safe worthwhile considering how slow going navigating the lake could be in a heavy blizzard. The loss of all orientation information aside from the beacon puts Hosteen in a very vulnerable position: his only source of guidance comes from a signal directly under his enemy’s control. Which is precisely what Stannis uses to defeat him. So we have a good idea of what Hosteen is likely to do, and we have a glimpse of Stannis’s situation. What secret is Stannis employing to secure his victory? The beacons that burned along the shores of the Three Sisters were supposed to warn of shoals and reefs and rocks and lead the way to safety, but on stormy nights and foggy ones, some Sistermen would use false lights to draw unwary captains to their doom. He went so far as to threaten to hang me if it should happen that some ship went aground because the Night Lamp had gone black. The Night Lamp is one of those beacons around the Sisters that are supposed to be used to aid in navigation, but are in truth sometimes used to deliberately wreck ships upon the many hazards near shore. One could dismiss this as simple world-building. However the passages show that Stannis is fully aware that a false (or missing) beacon can be used as a weapon of sorts. This also wouldn’t a one-off encounter for Stannis either. He was the Master of Ships and served on the small council in King’s Landing. If the wrecking phenomenon got to the point that he needed to intervene, it was occurring on a regular basis. The desired target must not be able to invalidate your beacon; your beacon must be the only source of navigational information. This is most readily achieved by using the beacon when visibility is extremely limited. The beacons around the sisters are used on dark or rainy nights, in thick fogs or when the land and stars cannot be seen. A beacon on land could be used in the same conditions. It’s well within reason that a beacon would work the same in heavy snow as well. The target must believe that your signal is authentic. In a lot of ways this is dictated by knowledge of the beacon’s owner. Are they usually deceptive? For instance, a knowledgeable sailor might be more careful around the Sisters. Or more simply, it might be the fallacy that because a watchtower is supposed to be ‘around here’ that whatever beacon fire is found nearby is assumed to be from that watchtower. You’ll note that this is specifically how the Sistermen are successful, by dousing the official Night Lamp and erecting ‘false lights’ to mislead the unsuspecting. The passages above establish with certainty that Stannis Baratheon is fully aware of ‘false beacons’ as a general ploy and what maximizes their effectiveness. Stannis will douse the watchtower beacon and erect a ‘false beacon’ on the weirwood island. 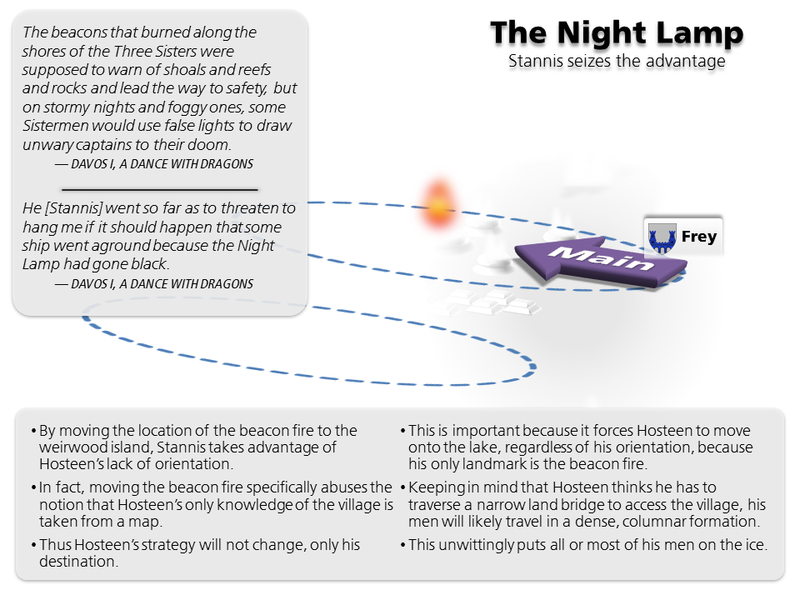 In using a false beacon, Stannis takes advantage of Hosteen’s reliance on the beacon for their orientation. If you saw a beacon glowing through the heavy snowfall and had no other landmarks to guide you, wouldn’t you think the beacon was the village watchtower? Recall that Hosteen certainly plans to advance some or all of his forces on the village via the land strip between the lakes. This dictates that he men would have to form up and approach the village in a rather direct approach in order to avoid the lakes: he cannot attempt to ‘envelop’ the village itself. Consequently, If he mistakenly thinks the watchtower is in the middle of the lake, then the majority of his forces inadvertently cross the lake while attempting to reach the perceived site of the village. Hosteen and his forces unwittingly crosses the lake to approach what he thinks is the watchtower beacon. Stannis smiled. You can probably count the number of times he smiles in the entire series on one of Theon’s maimed hands. By itself that’s conspicuous. Now consider the context, Stannis betrays his amusement upon hearing that deadfalls have proven effective against the Freys. If the many ice holes surrounding the weirwood isle are a component of his strategy, knowledge of the Frey susceptibility to such traps would certainly be reassuring. Stannis shows no sign of concern regarding how to defend against the oncoming Freys. Indeed, his reply suggests that he has defensive plans already underway. This is amusing because it betrays the central concept of Stannis’s strategy: using an enemy’s reliance on a map (and the corresponding lack of awareness of the true lay-of-the-land) to direct them into a trap. It’s additionally ironic because Jon says it specifically in reference to the lands northwest of Winterfell, approximately where Stannis currently is. The revelation that Stannis is poised to misdirect the Freys and lead them into a massive collection of icy deadfalls has a significance that cannot be overstated. It changes everything! The narrative that Stannis has seemingly gone mad is now invalid. Instead we see that he has been meticulously, covertly erecting a battle strategy from almost the beginning of his stay at the village. His reclusive nature did not belie a desperate, lost man: instead it was concealing a man deep in the throes of military planning. It further establishes a focal point for his battle plans, around which we can begin to erect a very strong idea of his strategy in full. One of the biggest concerns that Stannis still faces even with a false beacon is that Hosteen (or any commander) might be cautious in his approach. Heck Stannis didn’t even know that Hosteen was his enemy until Theon told him in The Winds of Winter. He must have been preparing for enemy commanders of all types, especially the very meticulous Roose Bolton or of similar ilk. A rudimentary element of a medieval confrontation is the notion of ‘forming up’ before battle. This means getting the horsemen/knights properly arrayed with the archers and other foot soldiers. It can also mean waiting for the baggage train to arrive, both for the train’s security and because the baggage train often contains important auxiliary elements that can aid with injuries after a battle and so forth. As noted, Stannis has an objective goal to capture the baggage train, and especially to do so without destruction or loss of the train. This engenders a strong incentive to capture the baggage train at a vulnerable moment. He also doesn’t control the narrative of the battle’s movements. Hosteen could just stop and look for the lakes and attempt to circumnavigate to the village. Stannis needs a reason to compel rash, foolish actions in the Frey army. What he needs is a way to separate the baggage train from the central body of the Frey army. He further needs a way to compel the Freys to hastily approach the beacon. Given that Stannis has those highly mobile mountain clansmen and their snow-hardy garrons, he has an easy opportunity to harass the approaching Freys. 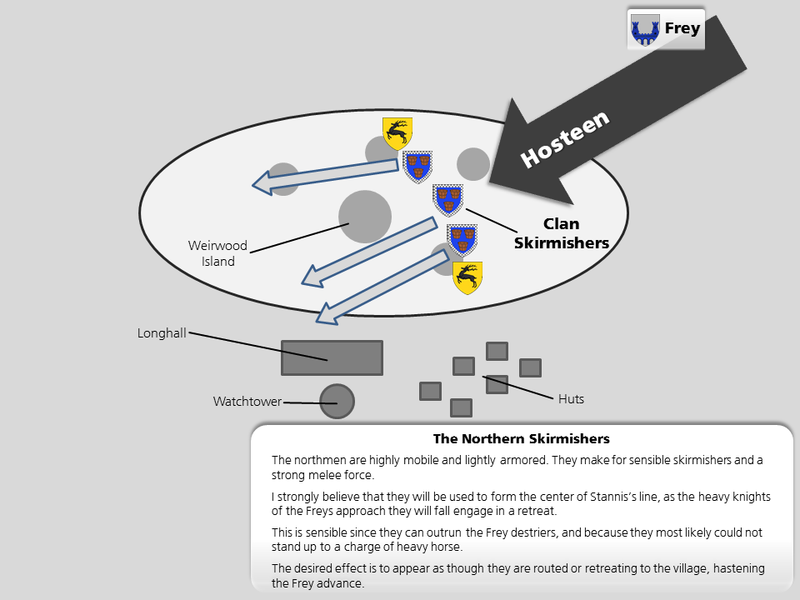 The idea is that Stannis will have the northmen harry the front of the advancing Frey forces, engaging in light skirmishes, nothing more than potshots with arrows or the like. These northmen will continually attack and retreat, preventing any direct confrontation. This tactic puts Hosteen in an extremely dangerous position. If he waits for the baggage train his men will undergo constant guerrilla barrages. If he attacks before everyone is formed up, he renders his rear and baggage train vulnerable. If he decides to retreat then he’s well and truly screwed, as the mounted skirmishers would be able to pursue him with abandon. You can see how effective horse archers/skirmishers work against enemies who retreat in the stories of the Comanche and their fights against the US Rangers (here). The effectiveness of these attacks is quite uncertain: it most likely will annoy the Frey knights and be unlikely to kill them due to their heavy armor, but against common soldiers trekking the wilderness (meaning not in formation) it could be effective. Frustrating Hosteen’s ability to play a cautious game by stymieing the assembling forces. Implying a weakness to Hosteen’s numerically and ‘technologically’ superior knights. Since the bows are unlikely to penetrate a knight’s armor, clansmen attacks might convey a sense of military impotence. Casualties would just be a bonus. The idea that Hosteen’s knights would likely be nigh-invulnerable to light horse archers is based on the historical accounts of how heavy cavalry evolved to counter horse archers. You can read more about this evolution via the amazing essay “Fighting Mobile Archers” found here. The linked essay shows that the prescribed tactics for such heavy cavalry against horse archers was to charge them down with lances and then switch to swords once in melee. Given the disparity in armor or horse breeds, the Freys are quite likely to think this is their best bet against skirmishing enemies. I’ve already discussed Hosteen’s characteristics as a commander, his emotional lability and how it has been explicitly shown to interfere with clear thinking. Most notably and relevant is that Hosteen is easily provoked. These attacks are detrimental to his unit cohesion. If he attacks before everyone is formed up, he renders his rear and baggage train vulnerable. Generally, speaking even Hosteen would likely know this. One of Stannis’s chief strategic benefits is that Hosteen’s brother Aenys died at the hands of Stannis’s men (in truth Mors Crowfood’s men). Given Hosteen’s combative nature it seems like this will cause him to believe that he effectively cannot retreat: it’s an insult to his brother and would appear to demonstrate Frey weakness on the field. Between the frustrating nuisance of a constant skirmisher presence and Hosteen’s volatile nature, it’s somewhat predictable that the clansmen can coax Hosteen into a premature military action. I cannot retreat. If I wait, I may lose men to sneaky clansmen. These clansmen ride weak horses, they cannot have a strong line, particularly one that could stand up to my heavy horse. If I instead advance, I can deny/hinder their attacks and perhaps defeat their weakened remnants, minimizing my own casualties. They are additionally situated in a position between two obstacles, allowing me to crush their lines with a single charge of lances. With this in mind, we can take a detailed look at Stannis’s plans beyond harassing the coming Freys. Once Stannis has drawn Hosteen into an attack, what then? What does the initial engagement look like? Quickly, decisively defeat high-value targets, demoralize/rout others. Capture the Frey baggage train, seizing vital foods and more. Prevent escape, word reaching Winterfell. Summarily, I believe Stannis will drive the narrative of the battle in a fashion that initially suggests the Freys are going to win. Stannis then capitalizes on their overconfidence, luring the Freys into the lake and into his trap. He does this with the careful deployment of his forces, based on what we know of their various skills and attributes. Considering that Stannis knows his own men quite well, he would probably entrust them with the most vital positions. The southrons might need to be on the lake to some extent in order to sustain the appearance that they are on the land bridge. This would would help convince Hosteen that he had found the land bridge leading to the village proper. Keep in mind that with the false beacon in place, advancing towards the light already makes the most sense. These southrons are also largely in place to prevent Hosteen’s advance from becoming too broad, hopefully steering as many as possible onto the ice. The clansmen are an unruly, passionate lot. They might bluster and indeed have a lot of skill, but its not clear that they can follow orders under duress. They are also highly mobile. Coupled with the beacon apparently indicating Stannis’s seat of power and the southron flanks, the retreating skirmishers would readily encourage the knights to push through Stannis’s apparent front: What you see developing here is that the Freys will eventually be somewhere between those two southron ‘pillars’ that I described. From the Frey pespective it looks like they’re routing the enemy and destroying Stannis’s front, however from Stannis’s perspective, they Freys have unwittingly allowed themselves to become enveloped. There will be additional clansmen positioned in the woods surround the lake. These men will be tasked with surrounding the lake once the trap has been sprung, as well as securing the baggage train. I like to think of them as the ‘baggage handlers’ or ‘bagmen’. Further, Stannis himself will be be positioned on the weirwood island himself, surrounded by a small retinue of men, and likely coupled with some archers as well. 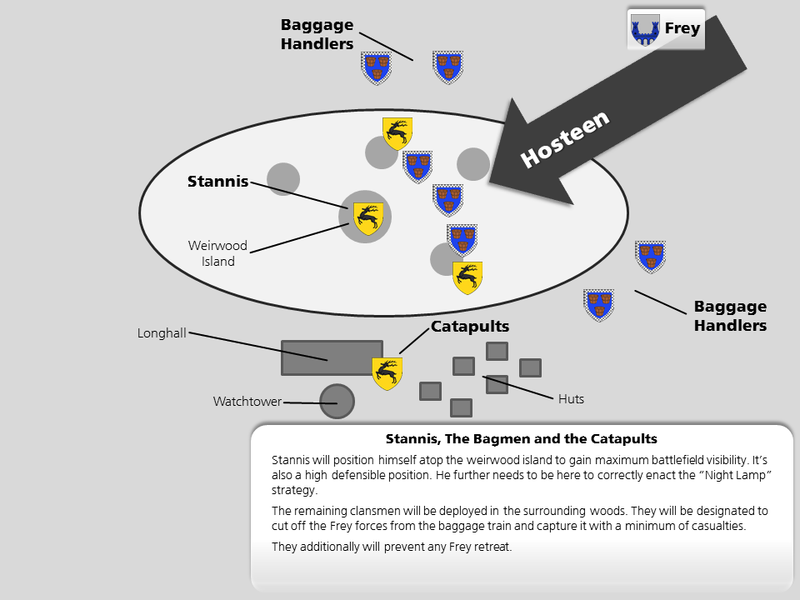 As the Freys advance toward the Stannis front lines, the bagmen will be able to emerge from the cover of woods and cut off the Frey forces retreat. Remember that the Freys will have no idea they are crossing a lake, so whatever military power Frey left behind it would largely have been to secure the belated baggage train. The bagmen would defeat these Frey elements and then capture the baggage train. With a full understanding of how I think Stannis will allocate his forces and how he will control the nature of the Frey approach, we can now appreciate the “Night Lamp” in action and predict the fallout. People arriving from Reddit will jump immediately to this point, under the assumption they are somewhat familiar with the Night Lamp theory already. This section is where the most notable change to the theory occurs and is the most fun to read. If you haven’t heard of the theory before, you may want to read from the beginning. The ostensible ‘ice-fishing’ holes that have been dug in great concentration around the weirwood island. The careful deployment and utilization of his forces, exploiting strengths and buttressing their weaknesses. A likely ability to coax the opponent into a hasty advance via a cadre of high-mobility skirmishers. We are now able to speculate with high confidence how the battle will unfold. As noted earlier, the clansmen will yield under the advancing knights, yet skirmishing as possible. Since the clansmen use bearpaws on foot and on horse, they should be able to outpace the Freys. An important element of attempting to break enemy lines with horse charges is that the horse do not become immediately engaged in melee. That puts horsemen unnecessarily at risk. Generally speaking the horses ride through reform and may charge again. This has the strategic advantage of causing disarray to the enemy lines, who now have to decide if they continue to face the enemy’s original location (where there are probably more troops) or if they turn their backs on them to defend against the horsemen. The reason this is an important tangent is that it means the knights will not immediately stop to fight the southrons. Instead they will pour through as a wave and generally end up riding through the point of least resistance. Which in this case just happens to be the middle with all of the clansmen. As noted, it’s very likely that Hosteen would anticipate breaking through Stannis’s lines, and perhaps swinging back around and then charging once more. This enhances the likelihood that his men will ignore that Stannis has deliberately posted his best men on the flanks of his line. What Stannis needs now is a way to coordinate all of his men, something that can coordinate their actions such that they move with such synchronicity that the Freys are decidedly defeated in a manner of minutes. He also needs (or perhaps would greatly benefit from) something that can maximize the effectiveness of those ice-fishing holes his men have been preparing. We know Stannis has trumpets in his employ and his clansmen are certainly capable with horns and drums. Any of those could be a suitable signal. However, that’s pretty lame. I don’t believe any of those will be used for this central, pivotal signal. The call to battle here is Stannis’s best chance to renew his men’s faith in his campaign, his best chance to demonstrate to the northmen just how great a king he is. A paltry trumpet seems so effete an instrument for such a purpose. Stannis will draw Lightbringer, blinding the Freys and signalling his army. Stannis Baratheon drew Lightbringer. The sword glowed red and yellow and orange, alive with light. Jon had seen the show before … but not like this, never before like this. Lightbringer was the sun made steel. When Stannis raised the blade above his head, men had to turn their heads or cover their eyes. Horses shied, and one threw his rider. The blaze in the fire pit seemed to shrink before this storm of light, like a small dog cowering before a larger one. The Wall itself turned red and pink and orange, as waves of color danced across the ice. Is this the power of king’s blood? …He slipped Lightbringer into its scabbard, and the world darkened once again, as if the sun had gone behind a cloud. So clearly if Stannis can replicate this ‘performance’ with Lightbringer, then has an incredibly useful tool for both maximizing the effectiveness of his traps and signalling his men. One can only imagine how devastating it would be for Hosteen’s knights to be charging at the false beacon only to have a light as bright as the sun stab them right in the eyes. Their horses as well. We can clearly see how this plays right into the ice holes surrounding the island. While this is obviously a compelling idea, I’m sure many readers are left wondering how Stannis could possibly re-enact the execution and thus engender the sort of ‘super-powered’ glow he achieved at that time. I do have a very concrete answer for this, but I discuss it later in this essay. Once the signal has gone out, we know that all of Stannis’s toys come into play. Let’s talk about the catapults first. It’s important to note that they don’t even need to be accurate. The catapults will be used to fire stones from the watchtower into the lake, accuracy not required. The goal is to shatter huge sections of the ice so that the Freys are swallowed up by the huge cracks that this bombardment creates. Since the catapults will be timed to go off while the Freys are blinded, they will have maximum effectiveness. The blinding light coupled with the blizzard will make it difficult for the Freys on the lake to ascertain whats happening and react: it will have a demolishing effect on unit cohesion. I suspect that the Freys would immediately rout at this point. This brings up the disposition of the southron pillars and many of the clansmen. These men will move to the lakeshore and decimate anyone routed Freys attempting to run from the massacre in the lake. Since the expectation is that Freys approaching these units will be panicked and thus easy prey. Even if these men can’t kill all of the routed men, those refugees are certainly going to freeze to death in the wilderness. Of course a major concern here is whether or not Stannis could be assured that the baggage train could be successfully taken with a minimum of risk. I mentioned this before, in fact it’s one of the reasons I strongly believe Stannis would take action to goad Hosteen to a hasty attack. The northmen on their bear-paws soon began to outdistance the rest of the host. They overtook the knights in the main column, then Ser Godry Farring and his vanguard. And meanwhile, the wayns and wagons of the baggage train were falling farther and farther behind, so much so that the men of the rear guard were constantly chivvying them to keep up a faster pace. So Stannis obviously knows just how much a baggage train can lag behind after a mere three days. Indeed its rather curious that these details about his own baggage train are highlighted precisely three days into his march. So there you have it. 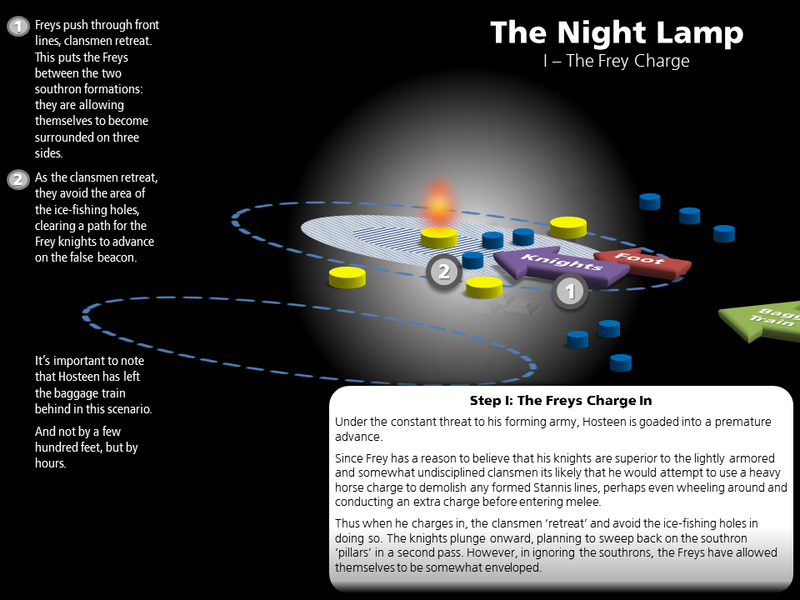 A general explanation of the “Night Lamp” strategy in action against the Freys. This is the core of the theory. Of course it raises many questions that need to be addressed, but I’ve broken them up over the next few sections. Delve into these subsequent sections at your peril, for I do not shy away from being thoroughly detailed. This theory proudly declares that Stannis will erect a false beacon on top of the ‘weirwood island’. However, I have yet to clarify just what that is. What will Stannis burn in order to imitate the watchtower beacon fire? Does he have to burn something special in order to ’empower’ Lightbringer? A bonfire of other wood. I don’t believe that any one of these encapsulate the full truth and most likely choice, but they inform our decision regarding the one option that is the most correct, the most likely. Stannis could certainly just burn a massive bonfire of mixed timbers from all sorts of available trees. This is certainly sensible since he would need to have a beacon that could last for hours, maybe days. A bonfire fits with this criteria. A generic bonfire however, does not seem to thematically connect in any way to Stannis’s Lightbringer. We (and possibly Stannis) have no idea if such a mundane fire will cause Lightbringer to have the desired effect. The weirwood tree could certainly be burned. After all it implied to be the largest tree on the island, and could be quite visible at some distance. We also know that weirwood was burned at Mance’s false execution, so its perhaps plausible that burning a weirwood would be the necessary ingredient in empowering Lightbringer. However, this would greatly offend the clansmen in his army. This would only be acceptable to the clansmen under extreme circumstances. We also don’t know just how long a weirwood can burn. Stannis would need to have exceedingly precise coordination to use a mere tree in this case. Well, we certainly know that Rattleshirt was burned alive when Stannis last blinded everyone with Lightbringer. So this certainly seems like a component to empowering Lightbringer‘s radiance. A very important side note is that it was not king’s blood that empowered Lightbringer at Mance’s execution. Rattleshirt was no king and yet the sword glowed like the sun all the same. This diminishes the idea that a king’s blood is truly necessary. However, its critical to realize that only we readers know this… all of Stannis’s men (and perhaps Stannis himself) all believe that king’s blood is important. This implicates Asha and Theon as possible targets for sacrifice. Unfortunately, a person set aflame does not burn for that long. Probably only about as long as a tree and very likely shorter than that. So we run afoul of the same timing problem. None of these options are ideal. The most notable issue is that the two choices that are most highly associated with the ritual which was demonstrated to empower Lightbringer do not burn for long. Thus they are impractical for use as beacon fires. Additionally, burning the weirwood presents serious religious issues. And sadly, the bonfire certainly could last long enough but seems to entirely lack the kind of significance one would expect to be associated with any ritual that empowered Lightbringer‘s brilliance. Stannis may or may not know how to precisely ‘pump up’ the brilliance on Lightbringer. Regardless of the truth, if Stannis wanted to power up the sword, then the best option is to simply replicate the conditions at Mance’s false execution as best as possible. A cage made of wooden branches, some of which were weirwood. A person to burn. Ostensibly someone with king’s blood (but in truth unnecessary). All of these things are well within the realm of possibility. It certain seems to make a lot of sense: the firepit would be the acting beacon fire, and the cage containing the sacrifice would be set alight just prior to the commencement of battle. This effectively duplicates the entire execution scene from Jon III – A Dance With Dragons. This makes it the most compelling choice given the thematic and military genius associated with using Lightbringer to blind a charging enemy. In light of the ‘weirwood cage’ proposal, we then need to determine the candidate to be sacrificed. As I noted, Stannis may or may not know about the truth of Mance’s execution. If he knows, then that means he could probably burn anyone. However if he doesn’t know, then he would likely believe it had to be someone with a king’s blood. A most important observation is that, either way, his men believe it needs to be someone with king’s blood. Given Stannis’s current situation, this leaves him only Asha and Theon, descendents of Balon Greyjoy and King of the Iron Islands. The text heavily implies that Theon is the most likely candidate, thus by default he is the expected victim. There are some problems with this though. As much as the King’s southron men want to see Theon dead, so too do the clansmen. And we know from the books that the clansmen have very different ways of carrying out sentences. Further there are military/strategic advantages to keeping Theon alive. The complexity of this issue goes beyond the scope of this essay and is discussed in one of the Mannifesto’s appendices: Much Ado about Theon. For the purposes of this essay, we will continue with the assumption that Theon is the victim. Stannis will use a bonfire on the weirwood island as a false beacon. Stannis will build a ‘weirwood cage’. Stannis will put Theon* in the cage and sacrifice him to the flames. While I cannot speculate as to what will happen to Wyman Manderly, I have sufficient reason to believe that it will not involve fighting Stannis Baratheon. He’s never declared for the Boltons. If you notice, the various messages sent by Ramsay have several seals: Dustin, Umber, and four Ryswells. No Manderly. This is ostensibly because Manderly is so slow to move his men to Barrowton. He leaves via Winterfell’s east gate and the Freys via the main gate (which is to the south I believe). Manderly brought no hostages and is presumably taking his entire force with him, leaving the Boltons no leverage over him. Since Manderly will be separate from the Freys, he could easily ‘languish’ in the snows and later claim his forces became incapable of moving forward. Manderly has Davos secretly hunting for Rickon, with the promise to accept fealty to Stannis if Rickon can be produced as the true Lord of Winterfell. Thus Manderly has incentive not to fight Stannis. If Manderly stalls and lets the others fight, he lets them whittle their own forces down. After all, Manderly did state to Davos that he has the largest force of knights and warships in the north. By letting the Freys lose men in a fight with Stannis he only improves his position. Manderly is also extremely well provisioned for camping in the snows. In short, Manderly has every opportunity to copy ‘Late Lord’ Frey and play the waiting game. There is a overwhelming amount of similarities between the crofter’s village and a village that Bran visits early in A Dance with Dragons. The similarities are so pronounced and so specific that I wholeheartedly believe this truly is foreshadowing Stannis’s battle at the crofter’s village. This section provides an overview of several important excerpts and explains their significance and how they substantiate some of my preconceived notions. Notice that it’s a fishing village. Since Stannis’s village is situated between two lakes, it’s perfectly reasonable that it too is a fishing village: after all, that’s how the army is surviving — by ice fishing. One criticism of this theory is that the Freys would know they are on a lake. Some people even cite their real-world experience as demonstration that nobody could be fooled. They came upon the promised lake not long after, and turned north as the ranger had bid them. That was the easy part. The water was frozen, and the snow had been falling for so long that Bran had lost count of the days, turning the lake into a vast white wilderness. Where the ice was flat and the ground was bumpy, the going was easy, but where the wind had pushed the snow up into ridges, sometimes it was hard to tell where the lake ended and the shore began. Even the trees were not as infallible a guide as they might have hoped, for there were wooded islands in the lake, and wide areas ashore where no trees grew. It’s conspicuous that Martin points out that Bran’s lake was dotted with small island full of trees, confusing the shoreline. It’s almost an exact match for the lake with the weirwood tree at the crofter’s village that Stannis has encamped. As the first sliver of a crescent moon came peeking through the clouds, they finally stumbled into the village by the lake. They had almost walked straight through it. From the ice, the village looked no different than a dozen other spots along the lakeshore. Buried under drifts of snow, the round stone houses could just as easily have been boulders or hillocks or fallen logs, like the deadfall that Jojen had mistaken for a building the day before, until they dug down into it and found only broken branches and rotting logs. Not only do we see that the village was completely indistinguishable, but that it could only be found when Bran warged into Summer. This makes it all but certain that the Freys will have absolutely no idea where the village is. 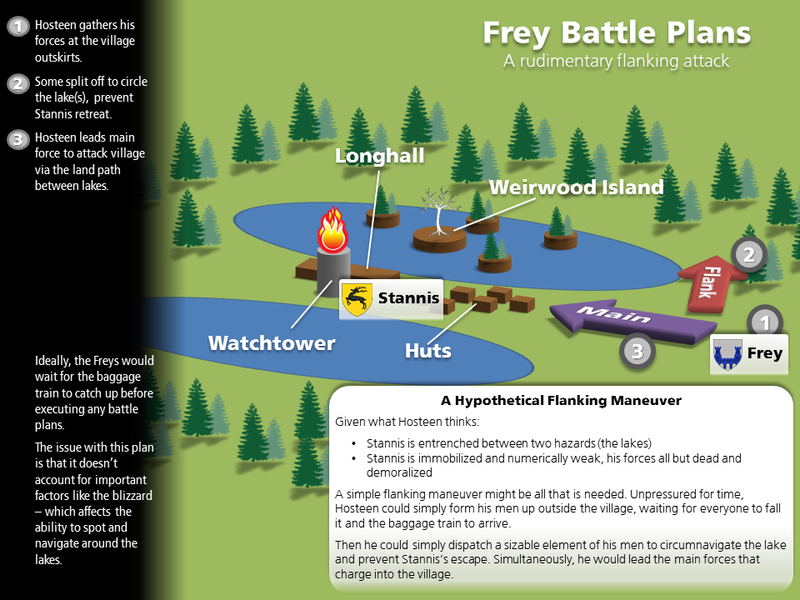 The combination of the invisible village and the undetectable lakeshore make it inevitable that the beacon fire (false or true) is the only way that Hosteen Frey’s forces can approach the village. The village was empty, abandoned by the wildlings who had once lived there, like all the other villages they had passed. Some had been burned, as if the inhabitants had wanted to make certain they could not come creeping back, but this one had been spared the torch. Beneath the snow they found a dozen huts and a longhall, with its sod roof and thick walls of rough-hewn logs. The next day the king’s scouts chanced upon an abandoned crofters’ village between two lakes—a mean and meagre place, no more than a few huts, a longhall, and a watchtower. Aside from the watchtower, they are almost identical twins. It’s a level of symmetry that goes beyond reasonable coincidence. “You said no fire,” he reminded the ranger. Thus Martin has armed the reader with everything needed to see how Stannis is completely invisible to his foes, and in contrast Hosteen Frey is completely dependent on whatever beacon Stannis allows Frey to see. Collectively this is a colossal amount of similarity. I find it unreasonable to believe this was by accident. This is a collection of interesting excerpts in like of this theory. Some of them may be more compelling that others. Pay particular note to what books they appear in because it often alters the significance. He was walking on rotten ice now, Tyrion knew. One false step and he would plunge through. Guest right or no, Jon Snow knew he walked on rotten ice here. One false step and he might plunge through, into water cold enough to stop his heart. Another idea concerns frozen lakes what happens in relation to them. True death came suddenly; he felt a shock of cold, as if he had been plunged into the icy waters of a frozen lake. The theory as written begs several questions. There are several notable gaps that must be explained satisfactorily before we can swallow it wholesale. If Stannis stopped at the village and deliberately prepared defenses, how did he know that the Freys were coming? He didn’t know about them until Theon arrived! That is a good question. I guess what it really comes to is this: do you find this theory convincing? If you do, then you must admit that Stannis somehow knew about an army coming to fight him, well before Theon and ‘Arya’ arrived. A core concept in military strategy is to never engage somebody that you can just allow to die on their own. Bolton had no real reason to attack Stannis whatsoever, the blizzard was decimating his men just fine. Stannis could not have known that the Freys and Manderlys would be coming for him for no good reason, for the same reason. At the very least Stannis must have known that he couldn’t just expect them to attack. The only thing that makes sense to me is that Stannis had planned to coerce the Boltons and their allies to attack. The only conceivable way to do so would be to steal that which gives the Boltons their perceived legitimacy. He planned to steal Arya Stark. This of course invokes the idea that Stannis was complicit in all of the scheming surrounding Mance Rayder. I do indeed believe this to be the case. You can read more about this in Operating in the Dark, another essay in the Mannifesto. This leads to a further observation. If Stannis knew that Mance was alive, that means he also knows that king’s blood was not necessary for the Lightbringer trick. Thus Stannis is not limited to Theon or Asha when selecting a candidate to burn. This is important because Theon and Asha have great strategic value, moreso alive than dead. I recommend reading my essay “Much Ado About Theon” if you want to explore that concept more. Prior to ‘discovering’ the Karstark betrayal, how could Stannis know just how the enemy would approach? How could he know they would be compelled to approach in a direct fashion? This is interesting. If you consider the situation without the Karstarks, Stannis would have no idea how the Freys might approach him. If you think about it, Stannis actually benefited from the map of his location that the Karstark maester secretly sent to Winterfell. Now the Freys and others, concerned for the lakes, will know they must either march densely across the land bridge en masse, split and take the land bridge from both sides, or take the risk of traversing the lakes. Knowing that the map has been received by the Boltons, Stannis can suddenly gauge the Frey direction of approach. Do I believe in happy accidents like this? Particularly ones that seem so crucial to Stannis’s plans? No. I strongly believe that Stannis knew about the Karstark betrayal well in advance, and used it to his advantage. You can read more about this in the next essay in the Mannifesto, Subverting Betrayal. If Stannis knew that Roose Bolton held all the cards, why would he be crazy enough to march to Winterfell with no idea on how to capture the castle? What is Stannis’s larger strategy? Explaining the evolution of Stannis’s strategy is a long process. Put simply, Stannis has more than a few tricks up his sleeve. If you feel confident about Stannis as a commander, you may wish to skip ahead and read Suicidal Tendencies and then perhaps jump into reading Volume III of the Mannifesto. Between Suicidal Tendencies and Volume III, I provide a very verbose study of Stannis’s campaign strategy. How could the Freys mistake an island for a watchtower? The islands in the lake are described as ‘rising from the water, like the frozen fists of some drunken giant’. This suggests islands with a rather steep or sheer sides and tall, blocky silhouette. Seen from the ground, a fire atop one of the larger islands might indeed look like a fire on top of some structure; and it’s especially interesting that the weirwood is noted to be on the largest of these islands. Stannis used to be the Master of Ships. This means he dealt with maritime law, crime, etc. He was called upon at least once to deal with people who repeatedly used a trick to purposefully wreck ships. They would extinguish the fire from a ‘known good’ beacon and erect a false beacon somewhere else. This would cause ships to crash because they were lured into rocks or something like that. Stannis is going to use this trick against the Freys. Stannis is currently stuck at a village in the woods between two lakes. His men have been carefully digging holes around an island in one of the lakes. He knows that the Freys will approach a certain way, expecting to use a narrow land bridge to access the village between the lakes. However, Stannis will eliminate the watchtower beacon fire and raise a false beacon atop the island in the lake. Confused and in a blizzard the Freys will unwittingly traverse the lake and into the ice-fishing holes. At that moment Stannis will draw his sword Lightbringer and blind the approaching army, maximizing the trap effectiveness and signalling the rest of his men. Catapults lob stones into the lakes shattering the ice and drowning many. Survivors are killed along the shores by men in waiting. And northmen move quickly to secure the Frey baggage train. This entry was posted in The Mannifesto and tagged Crofter's Village, Stannis on August 28, 2014 by cantuse. Yeah. Ironically I’m not a big Stannis fan. But all of the ‘foreshadowing/allusion’ is basically there. The only real *big* thing this version adds is Lightbringer, which really, really does make a ton of sense. The quote from Tarly was particularly damning. It starts to make the burning of Mance seem like a test run. Edit: It also compiles all of the additional support I found since posting the original essay. The Karstarks have king’s blood. Lightbringer is just too far fetched. I do agree with Stannis’s plan. I does explicitly say in ADWD that Stannis went to the three sisters and threatened to hang their lord (I can never remember his name) because he was lighting false beacons to wreck ships. He is implementing naval strategies to land. He is perfectly leeching Roose Bolton’s tactical error (get it?). Now, everyone knows the Freys and Manderlys won’t work well together. They will likely split up into two groups. If Lord Wyman can get back to White Harbor, then he can seal it off and pretty much starve out the North and keep the wealth for Stannis. I also have a feeling that this part of the series will take to the sea again. No matter how good Stannis is on land, he is better at sea. In ADWD Stannis tells Jon that he plans on taking one of Robert’s strategies in his upcoming encounter with Frey’s/Boltons. I thought it sounded similar to this theory because Stannis plans on luring the Frey’s out and at the last second slaughter every one of them on the lake. Let me know what you all think! This blog is great! To be honest, It’s a stretch to argue that this foreshadows the Night Lamp. But that’s approaching the subject with objectivity and keen adherence to reason. The excerpt you provided is pretty damn exciting and could be a very artistic allegory for Stannis and the Night Lamp. If you ask me, I like it very, very much. If I get the chance to further revise the essay I will definitely add it somewhere! Hosteen’s mother is a Crackehall and the arms of the Crackhall is a brindled boar on a brown field. That was awesome! So well thought out this can only be true. As you said yourself, the only reaching is Lightbringer being the signal, but I agree that it’s a big possibility. Not only that, but it would be an awesome scene. It didn’t feel like a theory as much as it felt like a logical conclusion. Congrats! Sorry for the much-delayed response, but thanks for the feedback. This was a very fun essay to write and it obviously spawned so much more for me. Something I’ve just thought of: if Stannis does indeed do all this, then it’s not just a piece of tactical genius, it’s also a masterpiece of strategic improvisation. To explain, Stannis could not possibly have known about the lie of the land surrounding the village as he set off from Castle Black. As you quote Jon Snow, “the map is not the land”, and Westerosi maps, like real-life Medieval maps, could in no way be accurate enough to give Stannis a proper view of the territory to make him realise that a decisive battle could be fought there. Thus, Stannis probably marched with a campaign in mind similar to what you suggest elsewhere in the Mannifesto, i.e. : force the Boltons and their allies to disperse their strength by making proxy attacks on the Dreadfort (and following the liberation of Deepwood Motte, potentially attacking Barrowtown as well, another piece of improvisation), but planned to fake his own death through other means. When he reached the crofter’s village, he was apparently able to grasp in moments the strategic and tactical implications: attacking the Dreadfort and Barrowtown disperses the Boltons and the Dustins, but it leaves the Freys in Winterfell. At the village, however, he has the ability to draw out and smash the Freys on ground perfectly suited to his needs. However, for the rest of the Mannifesto to be valid, this does raise the question of how Stannis planned to take Winterfell without the battle at the village, and how it fits in to the scheme with Mance to fake his own death. The first idea that comes to my mind is that he simply planned to let it out that his army starved to death in the blizzard by sending noble “defectors” to Winterfell to surrender (though this plan has the potential to be ruined if, when he sends out his “defectors”, Stannis does not know that the Karstarks are in league with Bolton, though if Mance is by that time glamoured as Ramsay, this might be mitigated). If we accept the rest of the Mannifesto as true, and Stannis did send Mance into Winterfell to rescue “Arya” and raise hell among the Bolton host, how would he communicate his change of plan to Mance? Does the timeline hold up for it to be communicated through Mors Umber as the Hooded Man? Hey – really awesome essay! Very interesting and well-considered. I think it would make your point better if you avoided the use of “lame” and “effete”. You already said the trumpet was paltry (though I’m not sure why, since the reason Stannis has trumpeters with him to do exactly what you’re suggesting they’re insignificant for, so why would he normally get them to do it if they’re paltry? He just has a option that is, in your opinion, better), but your point is basically that you think it will be cooler for him to draw lightbringer and may have the added benefit of blinding his enemies. You can say that without using ableist words like lame, or without saying both that the trumpet is a feminine instrument, and that that’s a bad thing. Something along the lines of “he could use trumpets or drums to sound the battle cry … but I think he has a better plan:”. Cool essay, as I said, that word use just stuck out to me as having meanings you probably didn’t intend / didn’t serve your point. Heh. You must feel pretty silly after watching Stannis get raped by the Boltons. Nope. I think there was more going on than meets the eye, and even if there isn’t… the show is definitely its own beast. This should totally happen! I’m disappointed in the show, but I’m holding out hope for the books. I like how this strategy mirrors the Battle of the Blackwater: The Freys are lured onto the lake like Stannis’ forces were lured into Blackwater Bay. Instead of being engulfed in Wildfire, they drown in ice, and finally the retreat is blocked by what you call “bagmen” instead of Tyrion’s chain. Stannis has learned from his one big failure and uses his knowledge for a great victory. Great theory, all in all, and really well backed by quotes from ADWD. Kudos! If Stannis used Lightbringer as a command signal, I completely agree that it would do an awful lot in the way of heartening his troops & establishing himself as the One True King amongst northerners. Without *something* to accomplish things of this nature, many northerners will be less enthusiastic once Stannis’ battles are no longer entwined with Winterfell/’Ned’s Girl’. I can’t imagine that this would be lost to Stannis. Or, who knows, maybe his victory at The Wall would be sufficient northern inspiration.. idk. Either way, despite the elegance of the Lightbringer signal solution, I can’t get behind it because I don’t think Stannis can pull it off while without (a) Melisandre or (b)The Wall, where magic is enhanced. Lightbringer wouldn’t be blindingly bright in the crofter’s village like it was at (f)Mance’s burning, especially through the storm. Mel uses powders & glamours to alter people’s perceptions, including how Stannis himself perceives events. After all, he apparently believes Lightbringer to be authentic, proving himself to be the Lord’s Champion. Despite a lack of regal ambitions (“I never asked for this”), he’s still fighting this war because he believes it’s his destiny and duty. Does Stannis realize that the sword was prophesized to be warm? Does he notice patterns in the sword’s varying levels of light? We know glamours utilize the weaving of light & shadows, and also that Mel’s “every gesture” is stronger near the wall. I suspect these factors have a lot to do with Lightbringer’s most impressive showing. We also don’t have any indication that Stannis believes he can manipulate Lightbringer’s glow, and he’s certainly not a man of ‘if’s. Ahem, *If* Lightbringer was as dazzling as it was at (f)Mance’s burning, horses may reasonably get spooked. This would be as true for his ever-so-mobile clansmen as it would be for opposing cavalry, and his safeguard against enemy retreat wouldn’t be quite so safe after all. Hold up, the clansmen are not going to shy away from peril. They seem almost cheerful at the opportunity to die with sword in hand (avenge the red wedding? so much yes) rather than just never returning from ‘hunting’. The friends and relatives with them are fine with dying, as they are all taking care of those friends and family left at home by becoming one less mouth to feed. The only things that make me question whether they’re going to be down with the plan is if the weirwood is set on fire *without* Theon attached. Somehow I feel like they’d be ok w a burning weirwood, as long as it was serving the purpose of giving Theon Turncloak to the old gods as well as a new red one. Who knows though, maybe their thirst for Frey blood renders this point moot. Reblogged this on Joanna Kundrat. Wow, nice find. I also noted a similar passage from Asha. Perhaps one day I’ll add these to a more speculative section of the essay. Hi. Great essay I love it, congrats!!!!! I have a question though. Ramsay is now angry because he does not have his reek and “arya” now. He is likely to get soldiers and ride with freys and manderly. Nothing is mentioned here about a possible ramsay army. What you think it could happen given that case? Love your essay, so much more interesting and satisfying than the show battle. That was pitiful and so poorly thought out. I’m sure the show’s writers have their own plans in place, but your essay was exquisite. If Stannis can construct catapults, why couldn’t he construct a replacement tower on one of the islands? His ‘yet’ comment implies that he will build fortifications of some kind, so this doesn’t seem like a stretch at all. 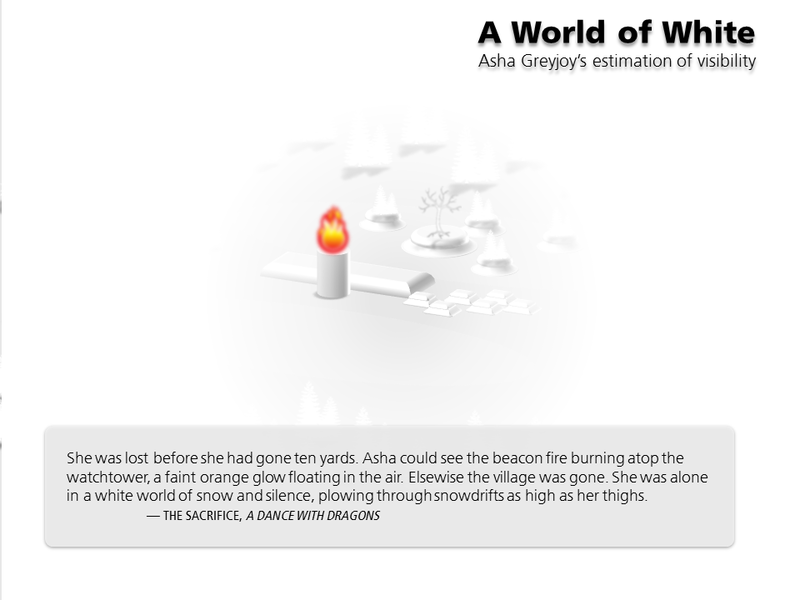 Therefore, there would be no need to burn the Weirwood or a person – he could just build another tower and keep it lit in place of the existing one using whatever fuel/method lights that one. During the First Crusade one of the unintended advantages was that many horses died due to heat and exhaustion in the marches to Jerusalem. While at first it seemed a hindrance to lose your capacity to field heavy cavalry, the consequence is that you now have a well-trained, elite infantry. This proved to be beneficial during sieges wherein dismounted heavy knights were among those climbing the walls, whereas it would normally be common men-at-arms. Assuming there is a victory for Stannis, I am hoping for the advantage of dismounted knights would prove beneficial in the siege of Winterfell. Very interesting read. The biggest flaw would be that the lakes are hard frozen. Its been hard winter for weeks. The ice is thick enough to drive a truck on. Its impossible to hack big enough holes. And with the cold those will freeze over, thick to walk on, in a couple of nights. 1. There is a ROAD that leads from Tohrrin’s Square through the Wolfswood and through the crofter’s village to Winterfell. This is the road that Stannis was taking when he found the village. There is no way that Stannis and his armies were orienteering through the dense woodlands. *This is the same road that the Frey army will take to reach the village. * Since the road goes through the village, how could they approach the village at an angle? The assumption that the essay makes is that the ONLY way the Freys can find the village is by using the beacon fire, which is false. Asha describes the Wolfswood as close and menacing, which frightens Stannis’ knights, or at least gives them unease. The village and lakes clearly are within some clearing or glade within the forest, but there is no mention that the wolfs wood doesn’t border the lakes, or is in the middle of a large clear valley where an army could change directions or marshal their forces. This also assumes that when they are close enough to see the fire, they will turn away from the road which is a CLEAR and DIRECT route to the village. While it may make sense in the dark, in a whiteout this makes no sense whatsoever. 2. Asha describes the snow-bound village as having snow drifts that reach her waist that she needed to push through. The Frey armies would be unable to move quickly, not having snow shoes on their soldiers or their horses. As far as we know, only the mountain clans do. This means they would need to clear and repair the road so their forces and baggage train arrive, leaving them vulnerable to attack from both sides of the road. Stannis only needs advance warning from scouts to hide forces along the length of the road well away from the village, and pinch the Frey army at several points. Additionally, most of the Frey forces will be afoot, and poorly provisioned for winter as many of their horses were killed or maimed in the collapse of the stables. These horses cannot be replaced, and unless the Freys brought along 1400 wolfskin pelts, they will not be prepared to slog for days in the *continuously raging blizzard* form battle lines and setup camp. In any case, there is no place for them to do this except on the road. That isn’t to say that Stannis’ forces can’t abandon the village and wait on the *other* lake, baiting the weirwood island as a trap for the bemused Frey forces. 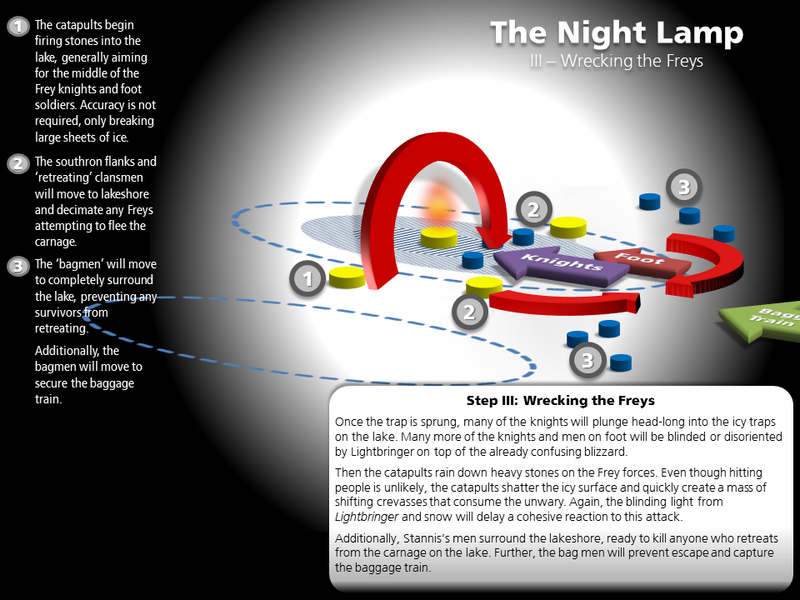 If the Frey forces reach the village and don’t find Stannis, they may fall into the trap by following the false lights. However, it is unclear how far the Frey forces would get… Once the first few soldiers start falling through the ice, why would the rest of the forces follow them in? The previous Bran passage that was cited, specifically says that the village he goes through is “The village was empty, abandoned by the wildlings who had once lived there, like all the other villages they had passed.” So all of the villages look like this. This doesn’t in any way link them. Not only this, but even through the blizzard, it was clear to Asha that there were two lakes, one with weirwoods and one without. This means that the Frey army would easily be able to distinguish frozen ground from frozen ice. Wrong. Stannis has been staring into the fires for quite sometime, and receives his insights from there. We know that Melisandre has taught him how through early Davos chapters when all three of them are together. We also know that Melisandre stated that the first thing she learned to see was danger to herself. It stands to reason that Stannis was taught the same thing and seeks it out constantly. 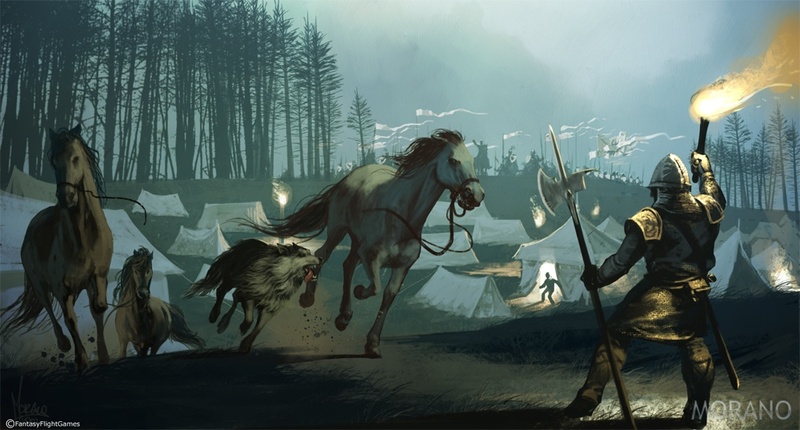 This allowed him to uncover Karstark’s treachery (as it was close and imminent) and question the maester.Also, it is highly likely that the mountain clans who dug the deadfall would send reports back along the road, and that they have scouts that relay messages back and forth, especially with information as important as enemy movements. What road are you talking about? “You’ll find them here.” Jon spread his burned hand across the map, west of the kingsroad and south of the Gift. There is no documented road northwest of Winterfell. While tracks and perhaps even wagon trails exist certainly no major thoroughfare.